THIS STYLE CAN ONLY BE DELIVERED IN METROPOLITAN FRANCE AND IN THE COUNTRIES OF THE EUROPEAN UNION. This restriction is due to the respect of customs formalities regarding trade of exotic leathers. -Sizing help: this product fits large, choose a size below your usual size. 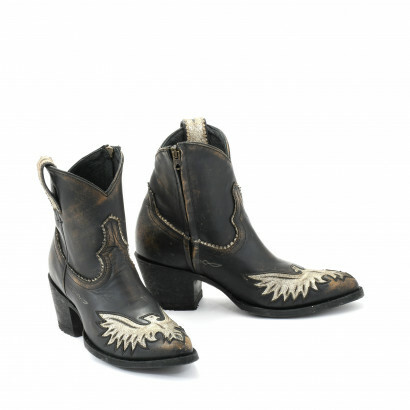 These women boots are made in two different leathers. The foot is realized in a black colored python leather and the top of the shaft enhanced by a matching tone ornamental embroidery for a "rock current look". A discreet internal zip allows an easy slip on.